Description: 32 count willow linen with Anchor floss and Sampler Threads from The Gentle Art. Description: 25 count dirty linen with Anchor floss, Impressions, and Sampler Threads from The Gentle Art. Stitches include satin. 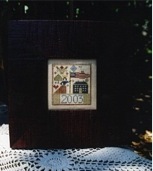 Designed for Old Mill Stitchery in Liberty, MO. Description: 40 count Dirty linen with Anchor floss. Stitches include French knots. Description: 32 count Iced Cappaccino hand-dyed linen from R & R Reproductions with Anchor floss and Sampler Threads from The Gentle Art. Stitches include smyrna, eyelets, satin, Kam's coils and over one. Description: 32 count blue linen with Anchor floss. Stitches include smyrna, eyelet, satin and rhodes. Description: 32 count Vintage linen with Anchor floss. Stitches include smyrna, eyelets, satin, over one and spiderweb rosettes. Description: 32 count Glenshee linen with Anchor floss and Sampler Threads from The Gentle Art. Stitches include smyrna and satin. Description: 32 count Fawn linen from Lakeside Linens with Anchor floss and silk ribbon from The Thread Gatherer. Stitches include satin, eyelets, rhodes, smyrna and French knots. Description: 32 count Putty Belfast linen by Zweigart from Norden Crafts with Anchor floss, perle cotton and Sampler Threads from The Gentle Art. Stitches include smyrna, rhodes, satin and spiderweb rosettes. Description: 40 count Sandstone linen with Anchor floss and Sampler Threads from The Gentle Art. Stitches include smyrna and eyelets. Description: 36 count Dark Khaki Edinborough linen by Zweigart from Norden Crafts with Anchor floss and Sampler Threads from The Gentle Art. Stitches include eyelets, smyrna and satin. Description: 32 count Crème linen with Anchor floss. Description: 27 count Natural linen with Anchor floss. Description: 32 count Plum linen from Lakeside Linens with Anchor floss. Stitches include smyrna and satin. Description: 32 count White linen with Anchor floss. Description: 40 count Sandstone linen with Anchor floss. Stitches include eyelets and over one. Includes number chart for year. Description: 40 count sandstone linen with Anchor floss. Stitches include smyrna, satin and spiderweb rosettes. Description: 32 count Natural Glenshee linen with Anchor floss and Sampler Threads from The Gentle Art. Stitches include satin and over one. Description: 35 count Dirty linen with Anchor floss. Stitches include double leviathan, smyrna, four-side, over one and eyelets. Description: 32 count Tobacco linen from Norden Crafts with Anchor floss. Stitches include smyrna and long stitches. Description: 36 count 36 count Edinborough linen by Zweigart from Norden Crafts with Anchor floss. Stitches include eyelet and satin. Description: 35 count 18th Century Gold hand-dyed linen from R & R Reproductions with Anchor floss and Weeks Dye Works. Stitches include satin and spiderweb rosettes. Includes 4 buttons. Description: 36 count Dirty linen with Anchor floss and Needle Necessities. Stitches include eyelets and over one. Description: 35 count tea linen with Anchor floss. Stitches include smyrna, satin and eyelets. Description: 32 count Vintage linen with Anchor floss, Weeks Dye Works, Sampler Threads from The Gentle Art and silk ribbon from The Thread Gatherer. 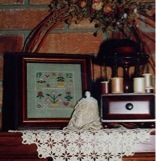 Stitches include satin, eyelets, French knots, smyrna and spiderweb rosettes. Description: Glenshee linen with Anchor floss and Weeks Dye Works. Stitches include eyelets and satin. Description: 35 count Tea linen with DMC floss. Stitches include eyelets. Description: 40 count Sandstone linen with DMC floss. Stitches include eyelets and over one. Description: 27 count natural linen with Anchor floss and Sheep's Silk from The Thread Gatherer. Stitches include satin. Description: 32 count Willow Belfast linen by Zweigart from Norden Crafts with Anchor floss. Stitches include smyrna and scotch. Includes button. Description: 36 count Taupe linen by Graziano with Anchor floss. Stitches include satin and eyelets. Description: 30 count antique cotton hand-dyed linen from R & R Reproductions with Anchor floss. Stitches include satin. Description: 29 count Light Pansie Glenshee linen with Anchor floss and Sampler Threads from The Gentle Art. Stitches include satin, rice and smyrna. Includes button.